More about the Commerce Intelligence Suite - Watch Now! During the past years, minubo has gone through an exciting evolution process: Coming from implementing individual BI projects for large eCommerce organizations and then transferring that knowledge into a standardized BI cloud solution for mid-sized online pure-players, we have now arrived at providing a comprehensive Commerce Intelligence Suite for established omni-channel brands and retailers like Lush, Betty Barclay or Intersport. 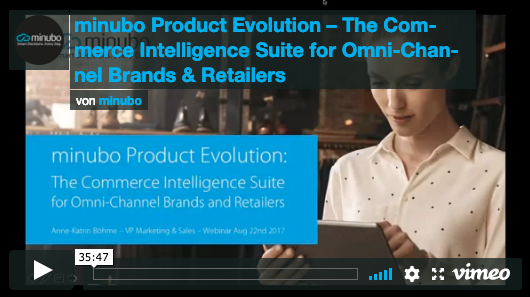 In this webinar, we want to show you what Commerce Intelligence and being data-driven in today’s omni-channel retail world actually means, what distinguishes that approach from traditional Business Intelligence and what, concretely, the minubo Commerce Intelligence Suite has to offer.